Fran Decker's colorful acrylic paintings capture the flavor of the Florida Keys. Key West landmarks, the sea, conch houses and tropical still lifes are her favorite subjects, but she also enjoys experimenting and trying different things. Some special projects have involved a book cover for the novel "Sand Dollar" and a CD cover for "This is the Life". Fran is happy to paint custom artwork and commission projects. Past projects include a restored church, houses, favorite bars and restaurants and a wedding. You can find her around town painting, as she is a founding member of the Key West Plein Air Painters, who meet every Wednesday to paint. She is also a member of Plein Air Florida. Fran's artwork can be found in various galleries and shops around Key West. 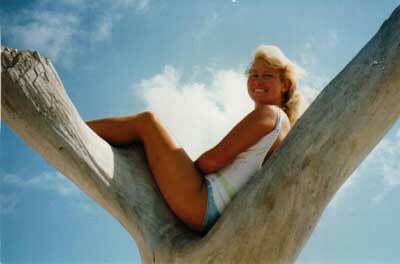 She also exhibits in local art festivals, notably Old Island Days Art Festival and Pigeon Key Art Festival. Fran has been painting since her teens, and has taken numerous local art classes. Mentored by Judi Bradford, she started selling her art in 2000. She is currently studying with Jim Salem. She and Judi along with four other artists opened a new gallery, 1100 SoDu in 2007. In November 2010, Fran opened her own gallery, Frangipani Gallery, featuring the fine art of Fran Decker and friends. Fran Decker has lived in the fabulous Florida Keys since 1988, first in a tree house by the sea in Marathon, and now in old town Key West in a big yellow house with porches under four huge sapodilla trees. She lives with her husband Bob and two ragdoll cats, Mango and Coco. Fran and Bob spent several years sailing their 35 foot Cheoy Lee, "Double Decker", from Boston to the Caribbean and Central America. They operated a private charter sailing business, Double Decker Sailing Charters out of Key West Bight for 16 years. Fran holds a U.S.C.G. 100 ton Captain's license and is an avid scuba diver and lobster catcher. Fran graduated from Wellesley College with a BA in Biology and worked for many years in the environmental field with The Nature Conservancy and the Florida Keys National Marine Sanctuary.